“The question is, what aspect of control are [they] inverting?” Martin Fowler posed this question about Inversion of Control (IoC) on his site in 2004. Fowler suggested renaming the principle to make it more self-explanatory and came up with Dependency Injection. For insight into IoC and DI, refer to Fowler's article at http://martinfowler.com/articles/injection.html. Java applications -- a loose term that runs the gamut from constrained applets to n-tier server-side enterprise applications -- typically consist of objects that collaborate to form the application proper. Thus the objects in an application have dependencies on each other. Although the Java platform provides a wealth of application development functionality, it lacks the means to organize the basic building blocks into a coherent whole, leaving that task to architects and developers. True, you can use design patterns such as Factory, Abstract Factory, Builder, Decorator, and Service Locator to compose the various classes and object instances that make up an application. However, these patterns are simply that: best practices given a name, with a description of what the pattern does, where to apply it, the problems it addresses, and so forth. Patterns are formalized best practices that you must implement yourself in your application. The Spring Framework Inversion of Control (IoC) component addresses this concern by providing a formalized means of composing disparate components into a fully working application ready for use. The Spring Framework codifies formalized design patterns as first-class objects that you can integrate into your own application(s). Numerous organizations and institutions use the Spring Framework in this manner to engineer robust, maintainable applications. The Spring Framework consists of features organized into about 20 modules. 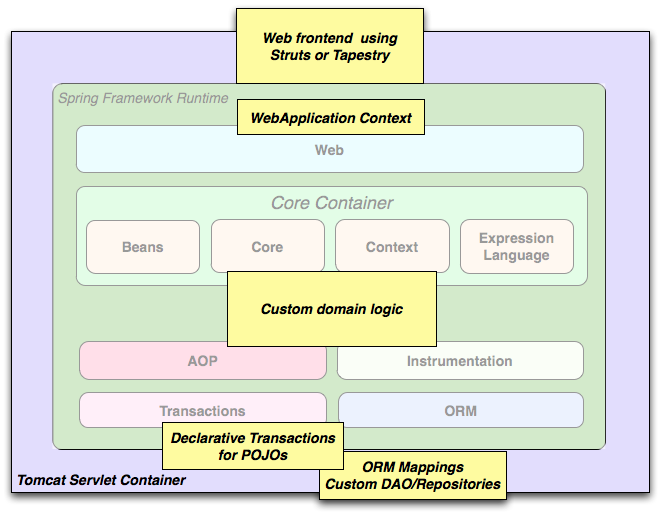 These modules are grouped into Core Container, Data Access/Integration, Web, AOP (Aspect Oriented Programming), Instrumentation, and Test, as shown in the following diagram. The Core and Beans modules provide the fundamental parts of the framework, including the IoC and Dependency Injection features. 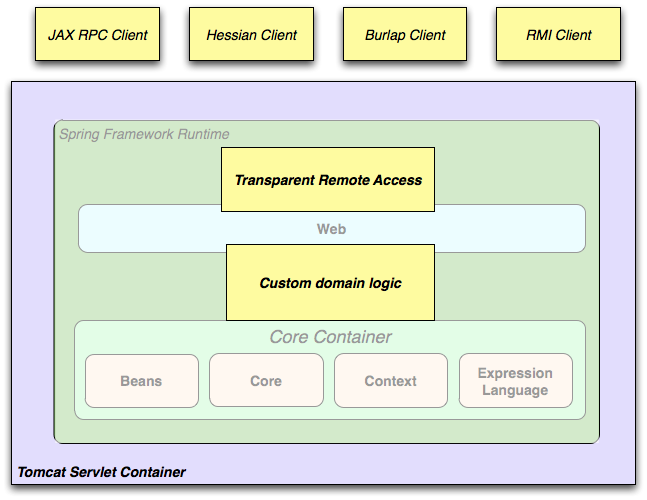 The BeanFactory is a sophisticated implementation of the factory pattern. It removes the need for programmatic singletons and allows you to decouple the configuration and specification of dependencies from your actual program logic. 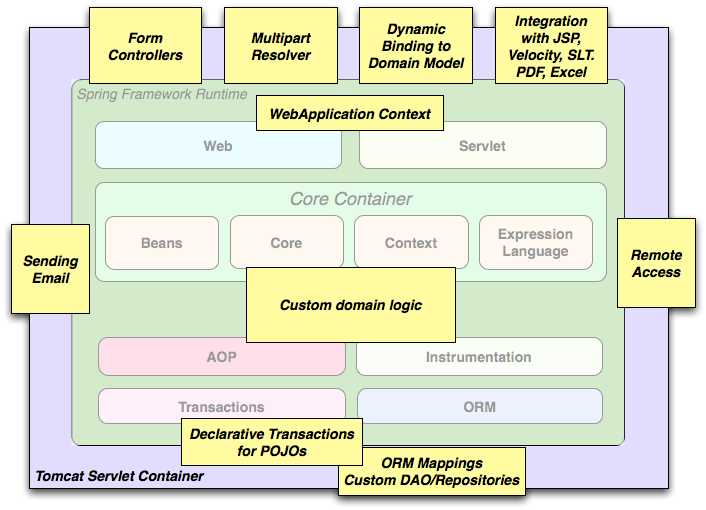 The ORM module provides integration layers for popular object-relational mapping APIs, including JPA, JDO, Hibernate, and iBatis. Using the ORM package you can use all of these O/R-mapping frameworks in combination with all of the other features Spring offers, such as the simple declarative transaction management feature mentioned previously. Spring's Web module provides basic web-oriented integration features such as multipart file-upload functionality and the initialization of the IoC container using servlet listeners and a web-oriented application context. It also contains the web-related parts of Spring's remoting support. The Web-Servlet module contains Spring's model-view-controller (MVC) implementation for web applications. Spring's MVC framework provides a clean separation between domain model code and web forms, and integrates with all the other features of the Spring Framework. The Web-Struts module contains the support classes for integrating a classic Struts web tier within a Spring application. Note that this support is now deprecated as of Spring 3.0. Consider migrating your application to Struts 2.0 and its Spring integration or to a Spring MVC solution. Spring's AOP module provides an AOP Alliance-compliant aspect-oriented programming implementation allowing you to define, for example, method-interceptors and pointcuts to cleanly decouple code that implements functionality that should be separated. Using source-level metadata functionality, you can also incorporate behavioral information into your code, in a manner similar to that of .NET attributes. The separate Aspects module provides integration with AspectJ. The building blocks described previously make Spring a logical choice in many scenarios, from applets to full-fledged enterprise applications that use Spring's transaction management functionality and web framework integration. Spring's declarative transaction management features make the web application fully transactional, just as it would be if you used EJB container-managed transactions. All your custom business logic can be implemented with simple POJOs and managed by Spring's IoC container. Additional services include support for sending email and validation that is independent of the web layer, which lets you choose where to execute validation rules. Spring's ORM support is integrated with JPA, Hibernate, JDO and iBatis; for example, when using Hibernate, you can continue to use your existing mapping files and standard Hibernate SessionFactory configuration. Form controllers seamlessly integrate the web-layer with the domain model, removing the need for ActionForms or other classes that transform HTTP parameters to values for your domain model. Sometimes circumstances do not allow you to completely switch to a different framework. The Spring Framework does not force you to use everything within it; it is not an all-or-nothing solution. Existing front-ends built with WebWork, Struts, Tapestry, or other UI frameworks can be integrated with a Spring-based middle-tier, which allows you to use Spring transaction features. You simply need to wire up your business logic using an ApplicationContext and use a WebApplicationContext to integrate your web layer. When you need to access existing code through web services, you can use Spring's Hessian-, Burlap-, Rmi- or JaxRpcProxyFactory classes. Enabling remote access to existing applications is not difficult. 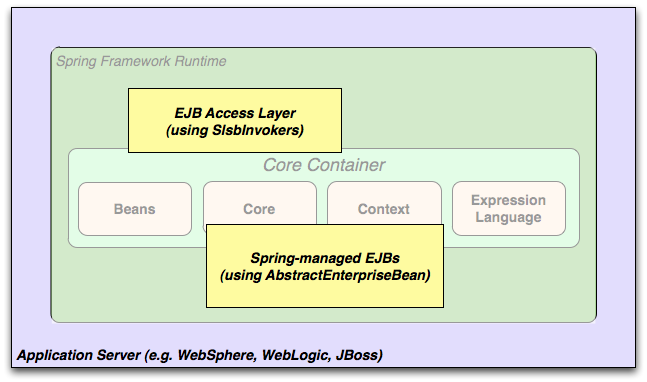 The Spring Framework also provides an access and abstraction layer for Enterprise JavaBeans, enabling you to reuse your existing POJOs and wrap them in stateless session beans for use in scalable, fail-safe web applications that might need declarative security. Dependency management and dependency injection are different things. To get those nice features of Spring into your application (like dependency injection) you need to assemble all the libraries needed (jar files) and get them onto your classpath at runtime, and possibly at compile time. These dependencies are not virtual components that are injected, but physical resources in a file system (typically). The process of dependency management involves locating those resources, storing them and adding them to classpaths. Dependencies can be direct (e.g. my application depends on Spring at runtime), or indirect (e.g. my application depends on commons-dbcp which depends on commons-pool). The indirect dependencies are also known as "transitive" and it is those dependencies that are hardest to identify and manage. If you are going to use Spring you need to get a copy of the jar libraries that comprise the pieces of Spring that you need. To make this easier Spring is packaged as a set of modules that separate the dependencies as much as possible, so for example if you don't want to write a web application you don't need the spring-web modules. To refer to Spring library modules in this guide we use a shorthand naming convention spring-* or spring-*.jar, where "*" represents the short name for the module (e.g. spring-core, spring-webmvc, spring-jms, etc.). The actual jar file name that you use may be in this form (see below) or it may not, and normally it also has a version number in the file name (e.g. spring-core-3.0.0.RELEASE.jar). On the community download site http://www.springsource.org/downloads/community. Here you find all the Spring jars bundled together into a zip file for easy download. The names of the jars here since version 3.0 are in the form org.springframework.*-<version>.jar. Maven Central, which is the default repository that Maven queries, and does not require any special configuration to use. Many of the common libraries that Spring depends on also are available from Maven Central and a large section of the Spring community uses Maven for dependency management, so this is convenient for them. The names of the jars here are in the form spring-*-<version>.jar and the Maven groupId is org.springframework. The Enterprise Bundle Repository (EBR), which is run by SpringSource and also hosts all the libraries that integrate with Spring. Both Maven and Ivy repositories are available here for all Spring jars and their dependencies, plus a large number of other common libraries that people use in applications with Spring. Both full releases and also milestones and development snapshots are deployed here. The names of the jar files are in the same form as the community download (org.springframework. *-<version>.jar), and the dependencies are also in this "long" form, with external libraries (not from SpringSource) having the prefix com.springsource. See the FAQ for more information. In a public Maven repository hosted on Amazon S3 for development snapshots and milestone releases (a copy of the final releases is also held here). The jar file names are in the same form as Maven Central, so this is a useful place to get development versions of Spring to use with other libraries depoyed in Maven Central. So the first thing you need to decide is how to manage your dependencies: most people use an automated system like Maven or Ivy, but you can also do it manually by downloading all the jars yourself. When obtaining Spring with Maven or Ivy you have then to decide which place you'll get it from. In general, if you care about OSGi, use the EBR, since it houses OSGi compatible artifacts for all of Spring's dependencies, such as Hibernate and Freemarker. If OSGi does not matter to you, either place works, though there are some pros and cons between them. In general, pick one place or the other for your project; do not mix them. This is particularly important since EBR artifacts necessarily use a different naming convention than Maven Central artifacts. Naming Convention: Version Varies. Many new artifacts use m.m.m or m.m.m.X (with m=digit, X=text). Older ones use m.m. Some neither. Ordering is defined but not often relied on, so not strictly reliable. OSGi version number m.m.m.X, e.g. 3.0.0.RC3. The text qualifier imposes alphabetic ordering on versions with the same numeric values. Quality Assurance By policy. Accuracy is responsibility of authors. Extensive for OSGi manifest, Maven POM and Ivy metadata. QA performed by Spring team. Hosting Contegix. Funded by Sonatype with several mirrors. S3 funded by SpringSource. Although Spring provides integration and support for a huge range of enterprise and other external tools, it intentionally keeps its mandatory dependencies to an absolute minimum: you shouldn't have to locate and download (even automatically) a large number of jar libraries in order to use Spring for simple use cases. For basic dependency injection there is only one mandatory external dependency, and that is for logging (see below for a more detailed description of logging options). Next we outline the basic steps needed to configure an application that depends on Spring, first with Maven and then with Ivy. In all cases, if anything is unclear, refer to the documentation of your dependency management system, or look at some sample code - Spring itself uses Ivy to manage dependencies when it is building, and our samples mostly use Maven. That's it. Note the scope can be declared as runtime if you don't need to compile against Spring APIs, which is typically the case for basic dependency injection use cases. If you are managing your dependencies by hand, the URL in the repository declaration above is not browseable, but there is a user interface at http://www.springsource.com/repository that can be used to search for and download dependencies. It also has handy snippets of Maven and Ivy configuration that you can copy and paste if you are using those tools. If you prefer to use Ivy to manage dependencies then there are similar names and configuration options. The XML above is not valid because the lines are too long - if you copy-paste then remove the extra line endings in the middle of the url patterns. The mandatory logging dependency in Spring is the Jakarta Commons Logging API (JCL). We compile against JCL and we also make JCL Log objects visible for classes that extend the Spring Framework. It's important to users that all versions of Spring use the same logging library: migration is easy because backwards compatibility is preserved even with applications that extend Spring. The way we do this is to make one of the modules in Spring depend explicitly on commons-logging (the canonical implementation of JCL), and then make all the other modules depend on that at compile time. If you are using Maven for example, and wondering where you picked up the dependency on commons-logging, then it is from Spring and specifically from the central module called spring-core. The nice thing about commons-logging is that you don't need anything else to make your application work. It has a runtime discovery algorithm that looks for other logging frameworks in well known places on the classpath and uses one that it thinks is appropriate (or you can tell it which one if you need to). If nothing else is available you get pretty nice looking logs just from the JDK (java.util.logging or JUL for short). You should find that your Spring application works and logs happily to the console out of the box in most situations, and that's important. Switching off commons-logging is easy: just make sure it isn't on the classpath at runtime. In Maven terms you exclude the dependency, and because of the way that the Spring dependencies are declared, you only have to do that once. That might seem like a lot of dependencies just to get some logging. Well it is, but it is optional, and it should behave better than the vanilla commons-logging with respect to classloader issues, notably if you are in a strict container like an OSGi platform. Allegedly there is also a performance benefit because the bindings are at compile-time not runtime. A more common choice amongst SLF4J users, which uses fewer steps and generates fewer dependencies, is to bind directly to Logback. This removes the extra binding step because Logback implements SLF4J directly, so you only need to depend on two libaries not four (jcl-over-slf4j and logback). If you do that you might also need to exlude the slf4j-api dependency from other external dependencies (not Spring), because you only want one version of that API on the classpath. 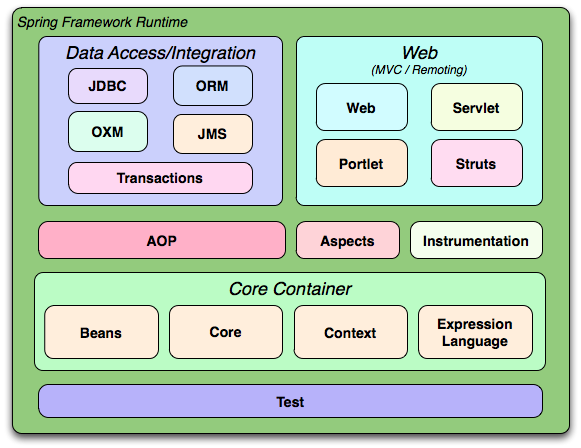 Many people run their Spring applications in a container that itself provides an implementation of JCL. IBM Websphere Application Server (WAS) is the archetype. This often causes problems, and unfortunately there is no silver bullet solution; simply excluding commons-logging from your application is not enough in most situations. In such cases with WAS the easiest thing to do is to invert the class loader hierarchy (IBM calls it "parent last") so that the application controls the JCL dependency, not the container. That option isn't always open, but there are plenty of other suggestions in the public domain for alternative approaches, and your mileage may vary depending on the exact version and feature set of the container.